Everybody’s Scalin’ – Baja Rey More Like Baja Bae « Big Squid RC – RC Car and Truck News, Reviews, Videos, and More! It isn’t often that I let out an audible gasp when seeing a new product release, but Team Losi accomplished such a feat yesterday when showing off their Baja Rey for the first time. The news release came out in the morning, and I was messing around with my phone before heading into the office. When I scrolled across the pics I muttered “Holy sh^^.”. I’m often ostracized around these parts because I’m not really a big basher like the other nuts under Squid employ, but by Caesar’s Gallopin’ Ghost I gotta get my hands on one of these. The demo video has me all hot & bothered. 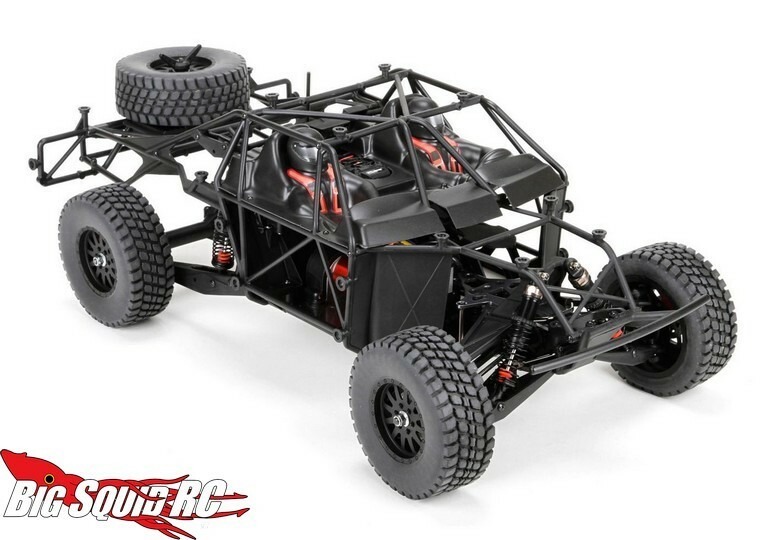 In my opinion, this is the coolest looking truck Losi has announced since the JRX-T. The scale trophy / short course truck has recently been done by several companies, but with mixed results. The Baja Rey sure looks like someone really did their homework. The body off shots look absolutely perfect. And while it would appear at first glance that scale was put above all else, the chassis sounds like it was designed with workability and performance in mind just as much as scale. That’s a wonderful thing to try and pull off. The performance really will be key, as to truly appeal to the mainstream basher (and dare I say racer?) the rig will have to be a runner as well as head turner. If it can’t jump and handles like a log truck, all those good looks will be for naught. The rear end is especially sharp looking, and if this truck gets popular I wouldn’t be shocked to see our friends at RC4WD and Vanquish pumping out goodies for it. RC4WD pumping out hop-ups for Team Losi race trucks, that’s quite a thought for you fellow old timers, eh? As always, we will save judgement until we get one in our hands (we have been disappointed recently by similar trucks) but given the looks, the buzz, and the Losi high performance pedigree there are plenty of reasons for optimism. If it’s as advertised then there may be several Brinks trucks heading their way to Horizon/Losi HQ in the near future.